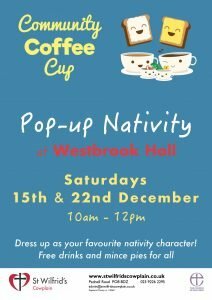 Come to our Community Coffee Cup Pop-up Nativity! Dress up as your favourite nativity character in our stable photo booth (bring a camera) – we’ve plenty of costumes for adults and kids. Free drinks and mince pies for all.